After going around the Viking exhibition at the British Museum last weekend, I spent some time in the BM's wonderful Egyptian room. 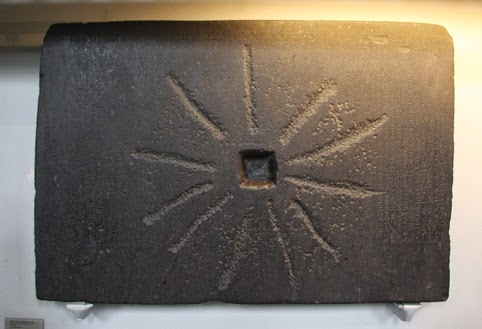 This is a photo of the Shabaka stone displayed there. The black basalt block, sometimes called the Shabako stone, dates to about 710 BC and was found in Memphis. The description beside it says: "This text... was inscribed by order of King Shabaka to preserve its contents for eternity. It contains an account of the creation of the world in which Ptah, chief god of Memphis, plays a decisive role." The hole in the middle and the grooves running from that are not part of the original design, but are there because it was later used as a millstone. The fact that the stone has had two important uses in its history - recording religious texts for posterity and also allowing people to grind flour to make the bread they needed to survive - raises a question. What is most important, the spiritual or the material?